I really love cute things. And I really love food. Put the 2 together and I have to tell you, I’m totally smitten. 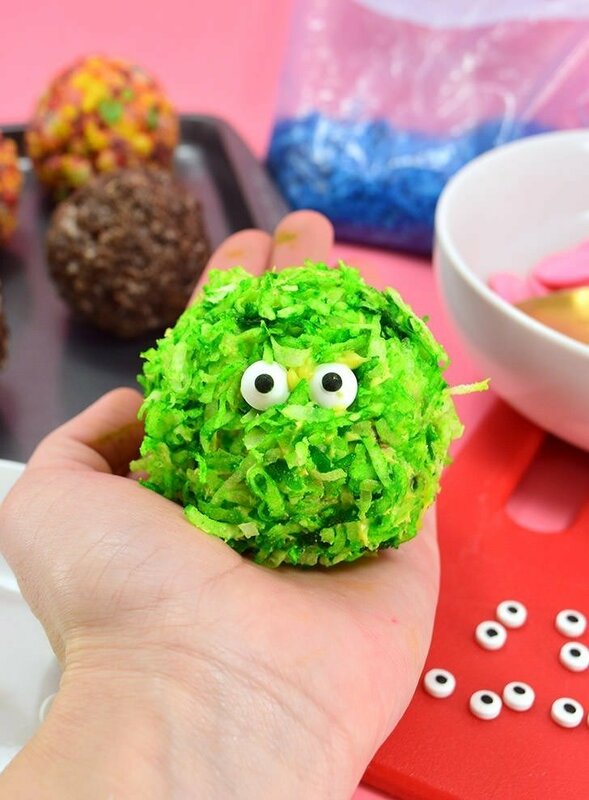 With Halloween coming up soon I wanted to make a colorful, cute edible treat that would be good, really for any time of the year. That means nothing scary or gory, just tasty and colorful and cute. And I have to tell you, I think I knocked this one out of the park! 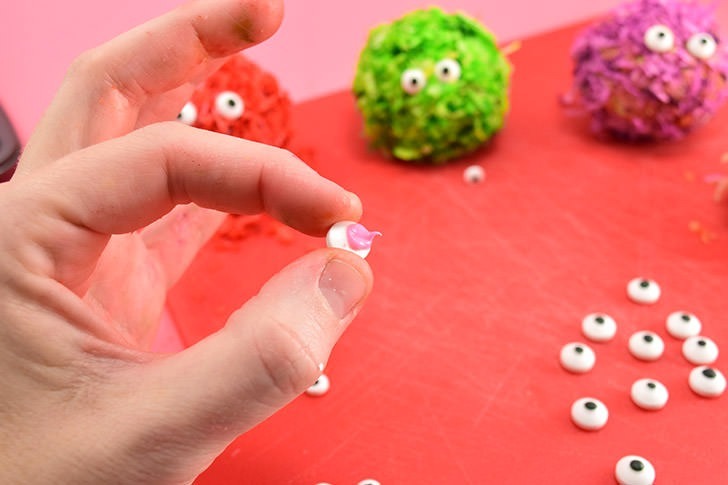 Pom poms are just about the cutest things in the world, anyway, and they’re popping up all over the place. But I haven’t seen edible ones yet. As it turns out, that was easy enough to correct. In all honesty I wasn’t quite sure how I was going to do it and I totally trashed my entire house in the process of figuring it out :) My kitchen was destroyed, every possible bowl dirty and there was colored coconut everywhere. EVERYWHERE. I’m half surprised it didn’t shake out of my hair in the shower. But it was worth it and I’ve got a pretty simple little food craft for you that I think you’re gonna just love as much as me. 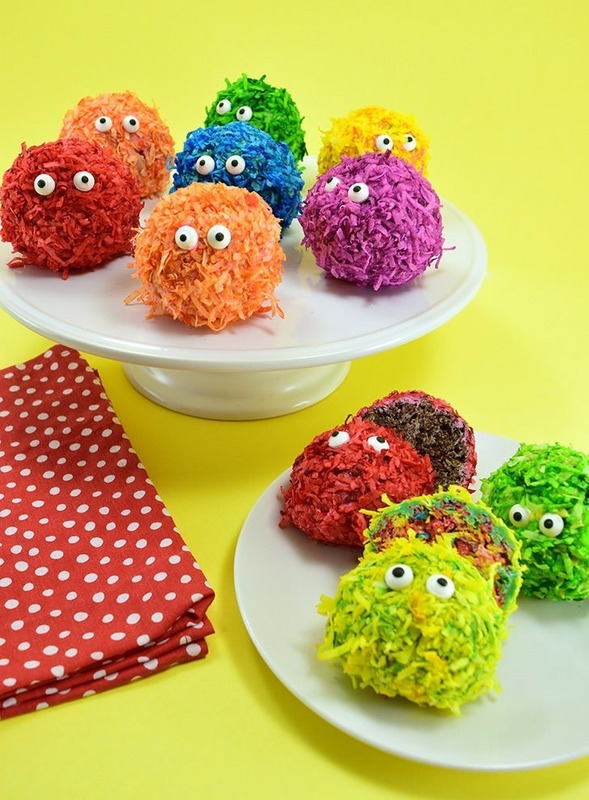 Make these for Halloween, or make these for homecoming. Heck, make these just freaking because. 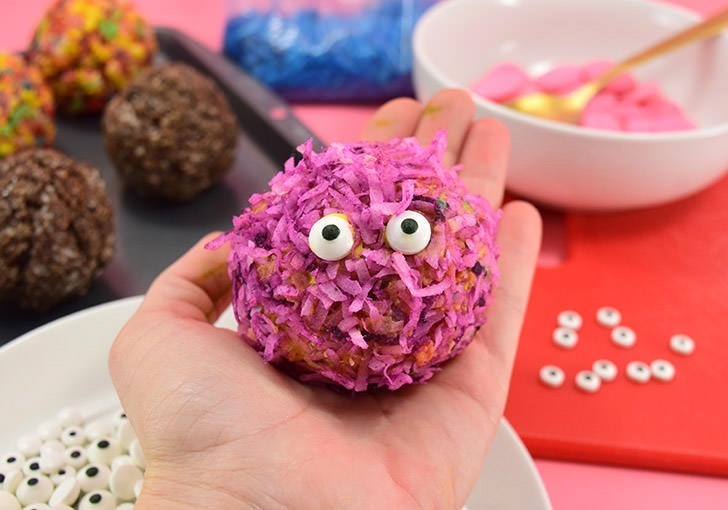 Use your favorite Crispy type cereal to make these crisp cereal balls for perfectly adorable edible pom pom monsters (cute food tutorial to follow). 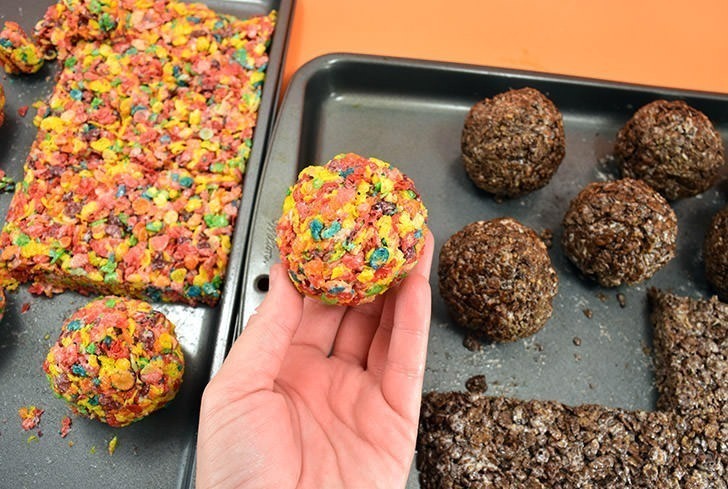 For this recipe I made both Fruity Pebbles and Cocoa Pebbles, as both are gluten free! In a microwave safe bowl melt butter. Add 8 ounces of marshmallows and melt, stirring every 20 -30 seconds until no marshmallows continue to hold their shape. Add dry cereal and stir to coat evenly. Spread in a non-stick cookie sheet and allow to completely cool. Cut the sheet of marshmallow/cereal mixture into evenly sized pieces. Take these sections, as needed, and push them firmly together, rolling them into a snack-sized ball. About the size of an small orange seems to make a quite generous snack. 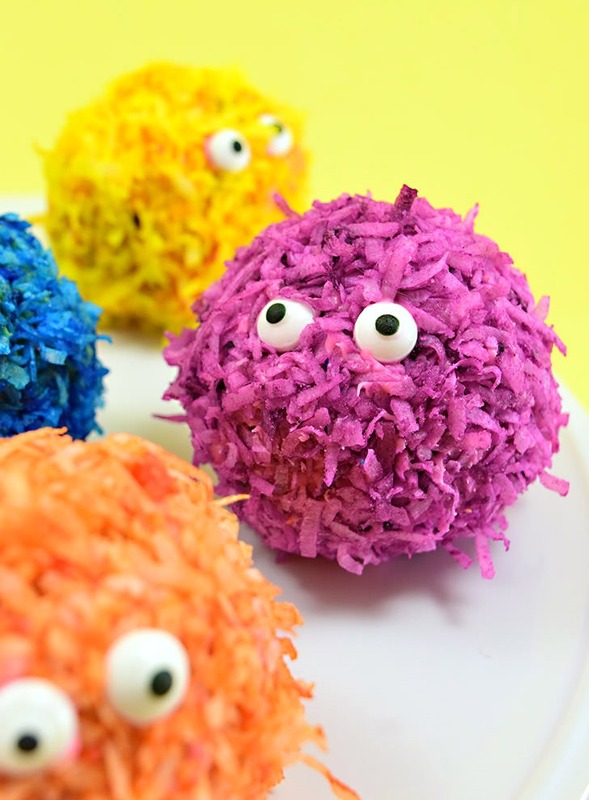 For this project you’ll need to color coconut for that distinctively fuzzy pom pom look. I mixed some in bowls and some in zipper bags and, though there was more waste, there was also a LOT less dishes when using the bags. Do whichever your sensibilities suggest because they both work out just as well. 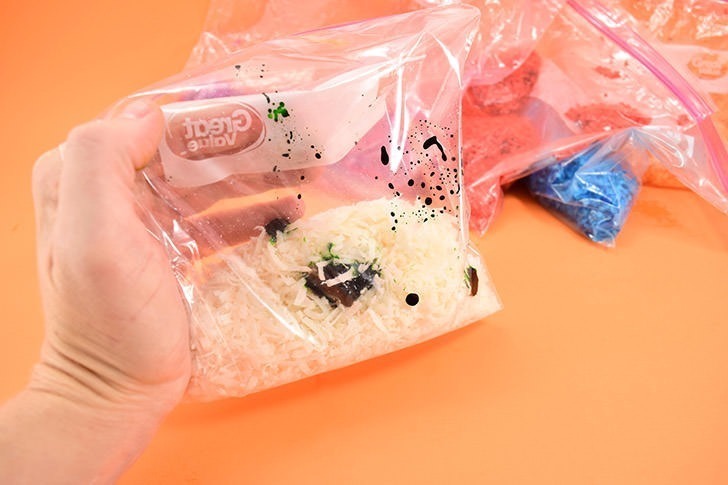 Take a small amount of gel food coloring (p.s. in that bag is NOT a small amount, it’s a freaking ton because the little bottle belched out its entire contents into the darn thing and I couldn’t get most of it back out easily :) and rub into the coconut. 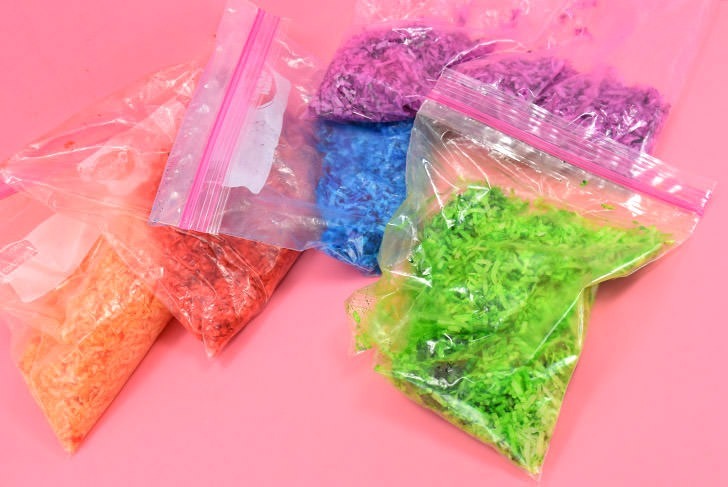 The more food coloring the more discoloration you might see on hands and mouths, but also the more vibrant your colors. In a small bowl melt candy wafers in the microwave, stirring every 30 seconds or so until it is mostly melted with the occasional chunk. Stir like crazy to fully melt all of the candy and create a nice, smooth candy. Set aside for a just a minute or 2 to allow to cool off slightly. Take one cereal ball and place it in the bowl. 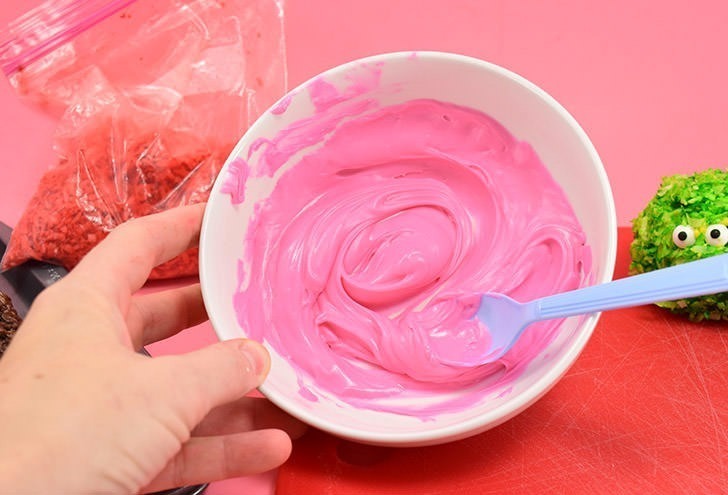 Using a spoon, or your hands if you prefer, and roll the ball in the candy melts, until fully covered. 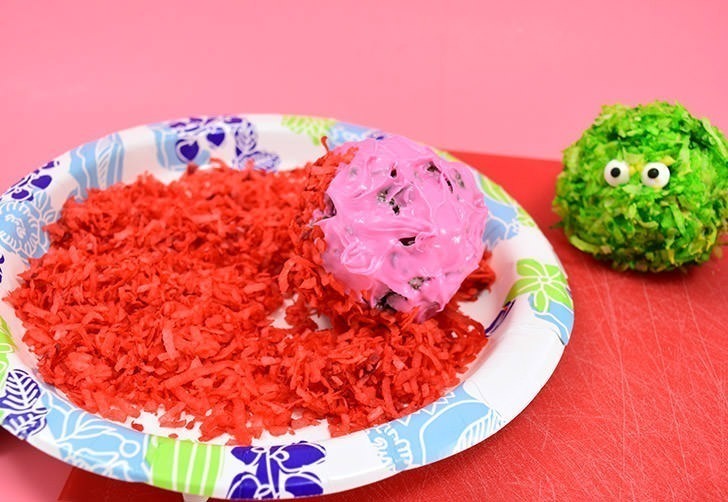 Place your colored coconut on a plate and your still wet candy covered cereal ball on top. Roll it around until the ball is well covered. 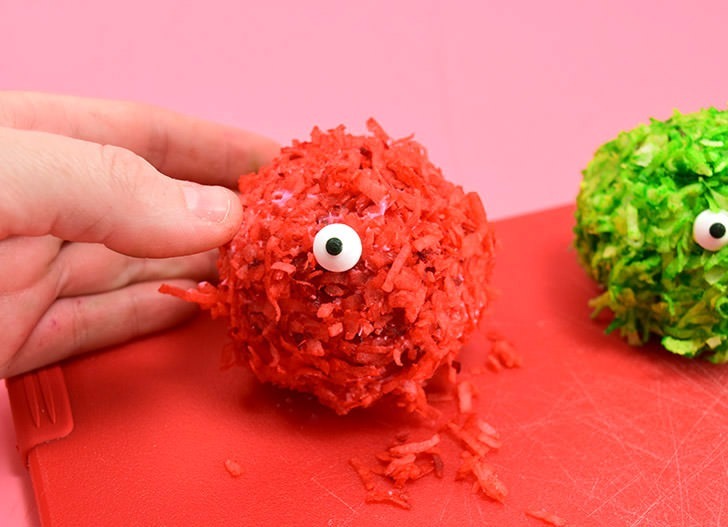 You might need to use your hands to press the coconut into the candy to cover bald spots. 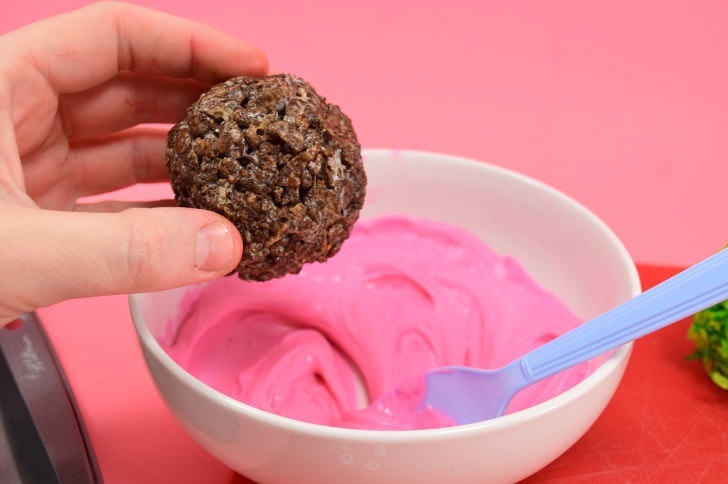 Set the coconut covered cereal ball on a flat surface, pushing down just enough to flatten the “bottom” so that it stands easily on its own without rolling around. Feel free to work with color combinations as you see fit. 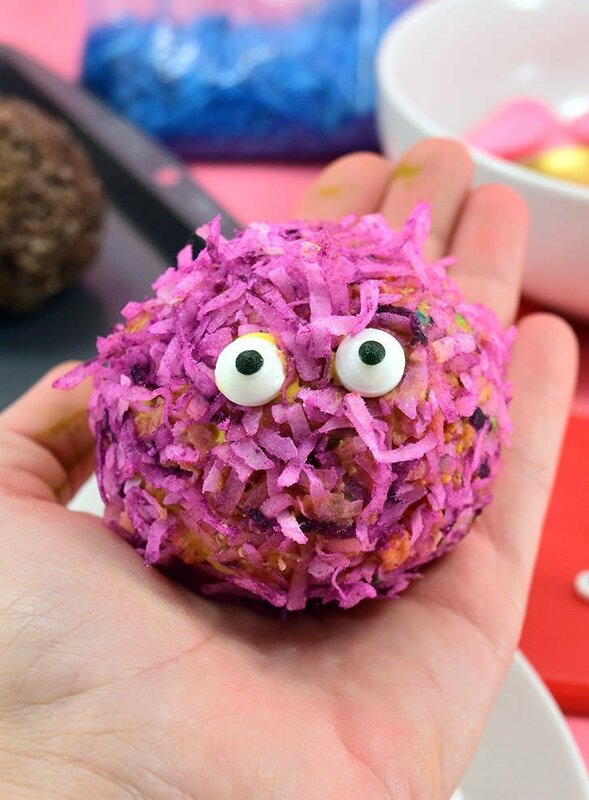 This little guy was my first fuzzy edible pom pom monster and I went with yellow melting wafers and purple coconut. Some color combinations are going to work really well, while others might fall flat and look muddy. After realizing that the results were hit or miss when mixing colors, and though I love my yellow and purple fellow up there, but since I had only a limited amount of melting wafers on hand in the first place, I decided to go with more similar color combinations, like pink under red, yellow under green, etc. And green under blue. 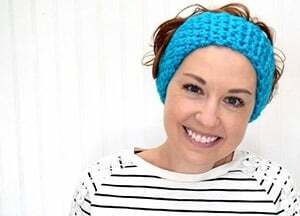 If you’re purchasing the items for this project rather than raiding the pantry as I did, feel free to match the colors perfectly, but know it isn’t completely necessary. 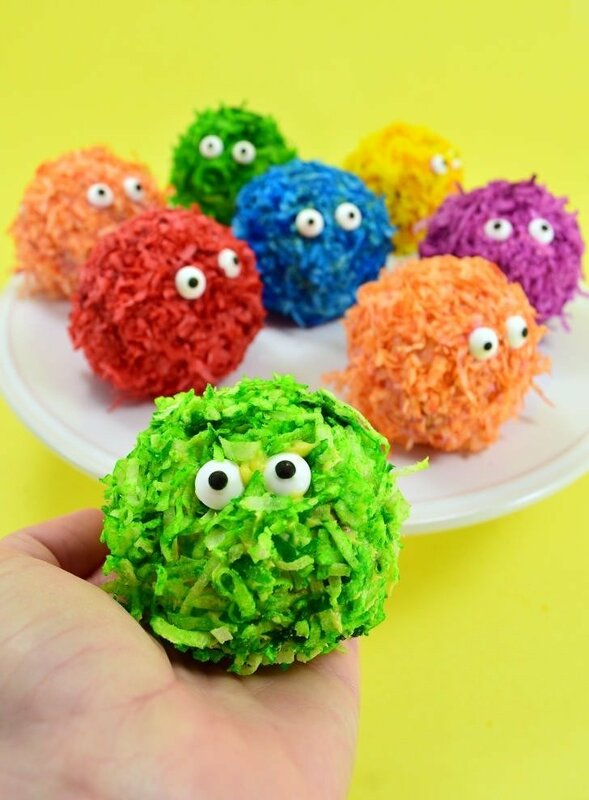 I made a good dozen cute edible pom pom monsters with only yellow, pink and green candy melts on hand. 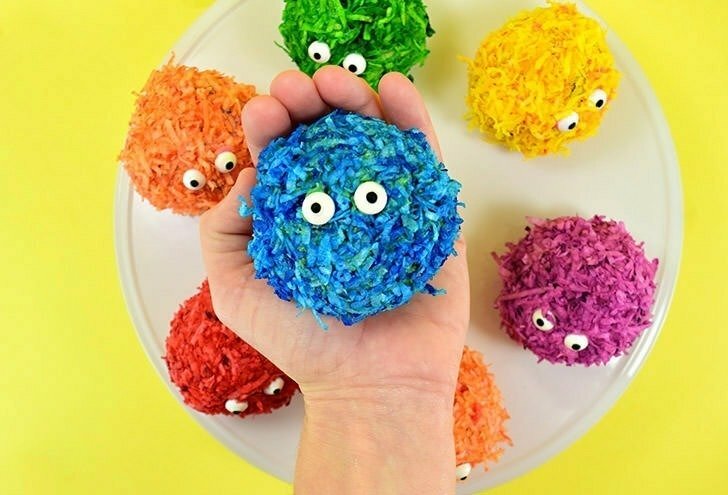 Sliced open, these cute snacks are a little bit easier for smaller hands to hold while eating, but feel free to go after them whole, like an apple with lots more calories, fat and sugar and infinitely more sass :) And no matter how you slice it (or don’t) these DIY edible pom pom monsters are the perfect sweet treat any time of the year!